Despite there being no listed varieties in Unitrade, patience and close attention will reveal that there are some really good shades to be found, paper varieties, booklet varieties as well as a wide range of possibilities for collecting plate blocks, re-entries, covers, first day covers and town cancellations. This post will look at all of these aspects in detail. 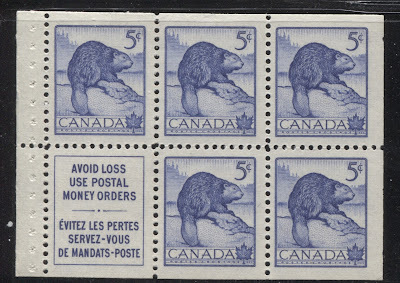 The wonderful thing about these stamps is that none of them are expensive to collect, with mint examples often being obtainable in bulk for face value, or at retail for a dollar or less per stamp. In used condition, you can still find these issues in bundles of 100 for 25c or so per bundle. These issues haven't received very much attention from collectors at all over the years, so I wouldn't be surprised if a disciplined and careful study of them turns up some interesting varieties beyond what I mention here. 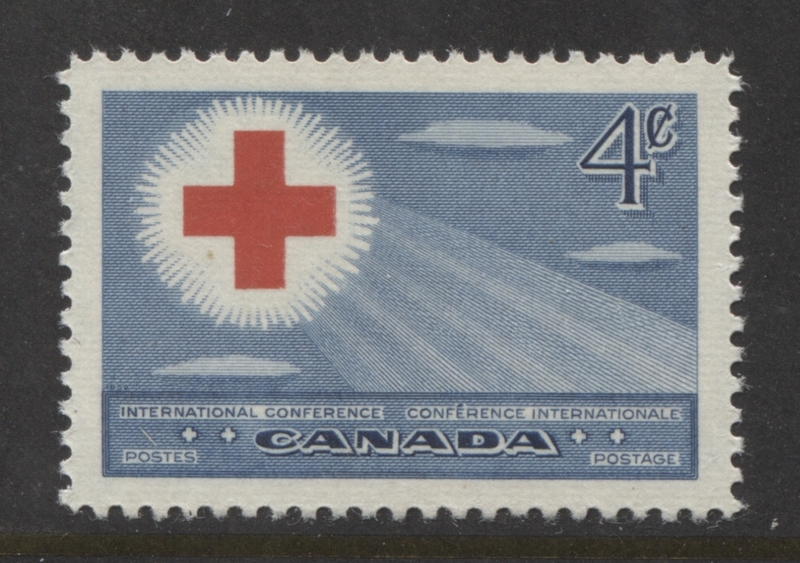 Herman Herbert Schwartz designed the 1952 Red Cross Issue, and the Prime Ministers issues of 1952 and 1954. John Alexander Crosby designed the 2c polar bear stamp from the 1953 Wildlife Issue. Emmanuel Otto Hahn designed the remaining wildlife stamps and the 1953 Coronation issue. Silas Robert Allen, who had been engraving Canadian stamps since the 1928-1929 Scroll Issue engraved all 11 stamps. 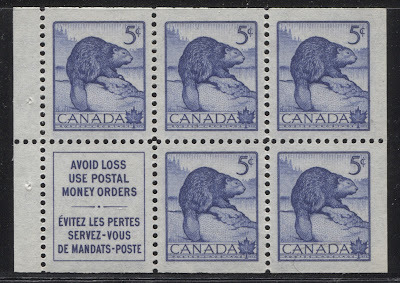 The stamps were all printed by the Canadian Bank Note Company in sheets of 400 stamps that were divided into four panes of 100 for every issue, except the 1952 Red Cross issue, which was printed in sheets of 200 that were divided into four panes of 50 stamps. 4c deep blue and carmine-red - Red Cross Conference. 3c rose-lilac - Sir John Abbott. 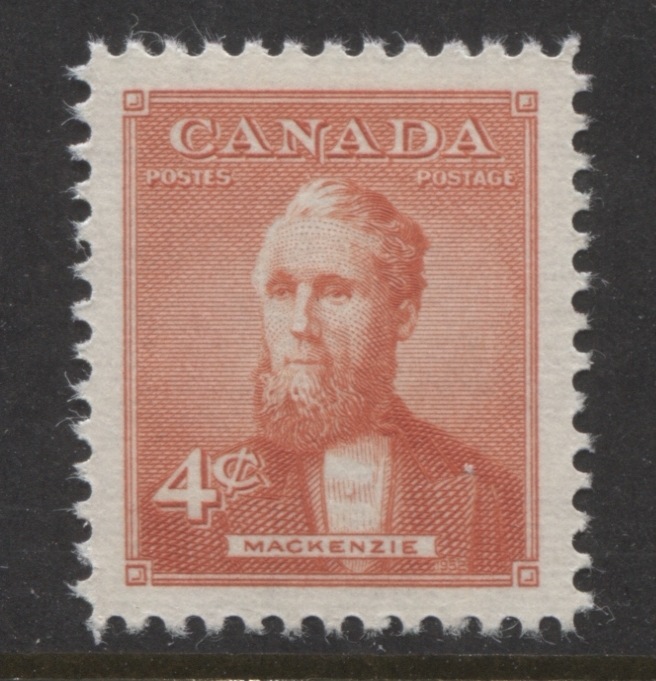 4c orange vermilion - Alexander Mackenzie. 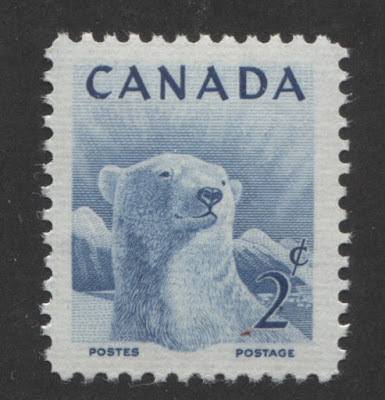 2c blue - polar bear. 3c deep olive brown - moose. 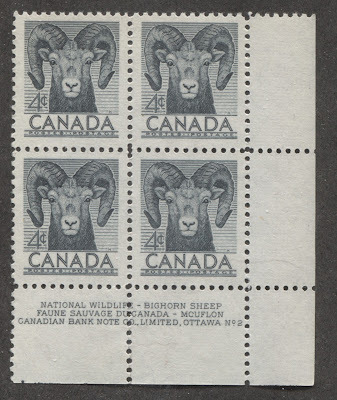 4c slate - bighorn sheep. 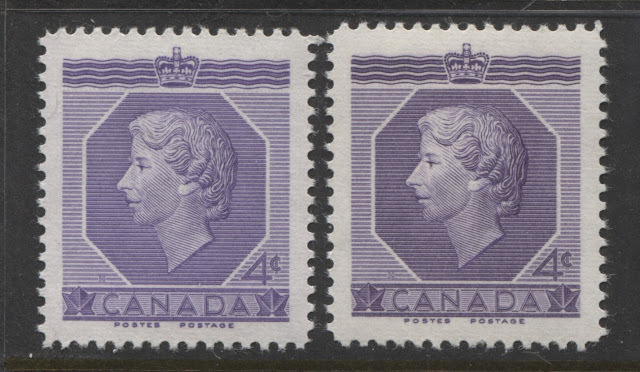 4c violet - Queen Elizabeth II. 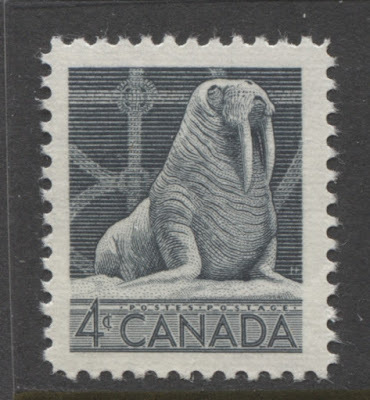 4c deep greyish slate - walrus. 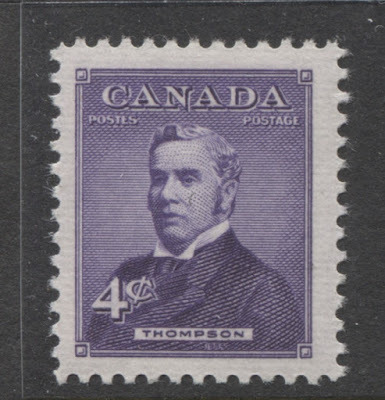 4c purple violet - Sir John Thompson. 5c deep bright blue - Sir Mackenzie Bowell. Shade varieties and aniline inks. 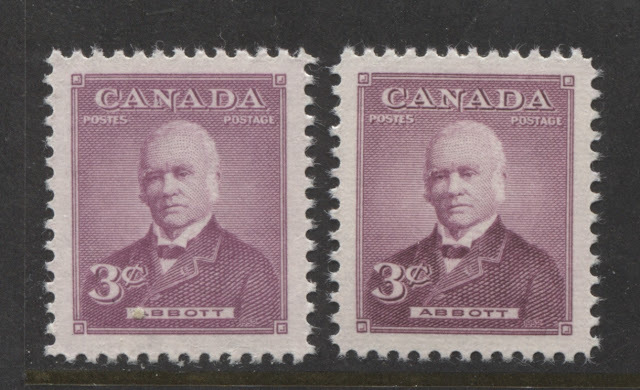 Here are two, quite distinct shades of the rose-lilac colour of the 3c Abbott stamp. The difference is very striking, with the colour on the right being much deeper and richer than the one on the left. There may be other variations, but these are the main shades that I have seen. The 1953 Coronation issue, exhibits considerable variation in the colour, which ranges from a pale bluish violet, like the stamp on the left, to a blackish purple, like the stamp on the right. In between these two extremes you can find stamps that are a deeper bluish violet as well as a deep purple violet. 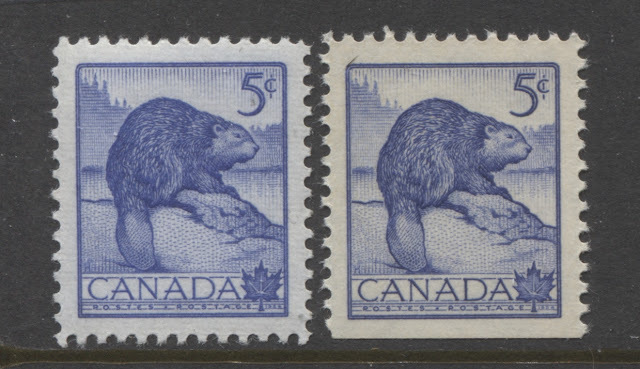 Here are two different shades of the ultramarine colour of the 5c beaver stamp from the 1954 Wildlife issue. Ultramarine was the standard colour for this stamp. However, I have seen shades in a deep dull blue that completely lack the brightness of ultramarine. I do not have these stamps now, so unfortunately, I cannot show them here. However, I will add additional scans as stamps in these more elusive shades become available. The blue of the 5c Mackenzie Bowell stamp varies mainly in terms of its brightness. The stamp in the middle is the bright aniline blue, which is much more distinct looking in real life compared to the stamps on either side of it. 1. The colour on the surface of the stamp appears very diffuse, as if it were bleeding into all of the paper fibres. 2. 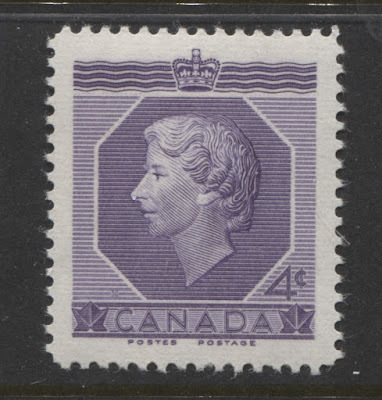 The colour is usually clearly visible from the back of the stamp. This scan shows and example of what I mean. The blue colour is barely visible through the back of the stamp on the left. 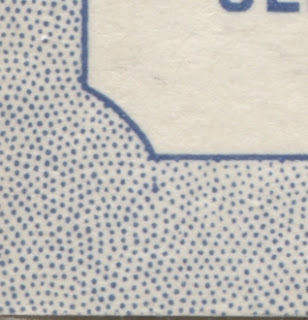 In contrast, you can clearly see the blue of Bowell's jacket showing through the back of the stamp on the right. 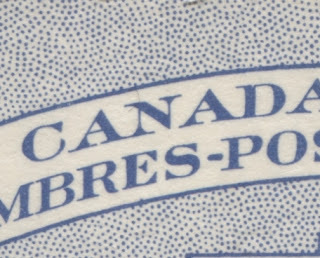 This is the middle stamp shown in the above scan. 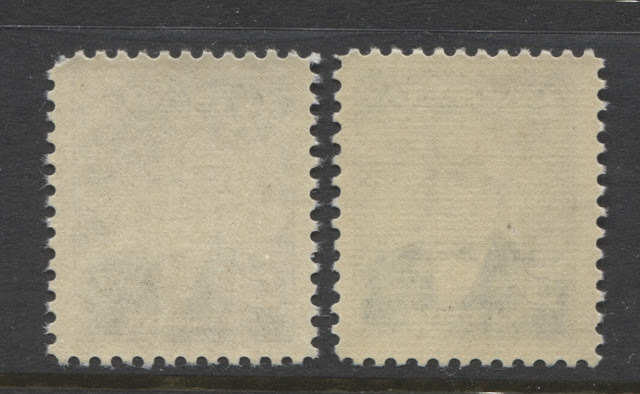 You can also see that these two stamps are printed on papers having a different texture, with the stamp on the right showing clear, horizontal ribbing, while the stamp on the left appears smooth. These paper varieties will be discussed next. The first type of paper shown on the right is the strongly ribbed paper. 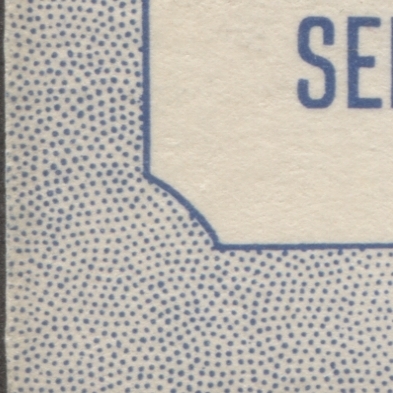 This paper has a highly ribbed appearance from both the front and the back. 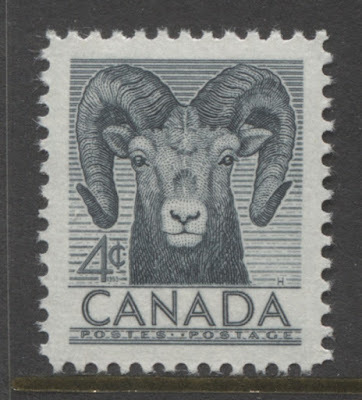 If you go back to the large scans of the stamp designs, you will see that all of them except for the 4c bighorn sheep are printed on this type of paper. The second type of paper, and that which the 4c bighorn sheep that I scanned is printed on, is a smoother paper that does not show strong ribbing on either side. This is shown on the left hand stamp. 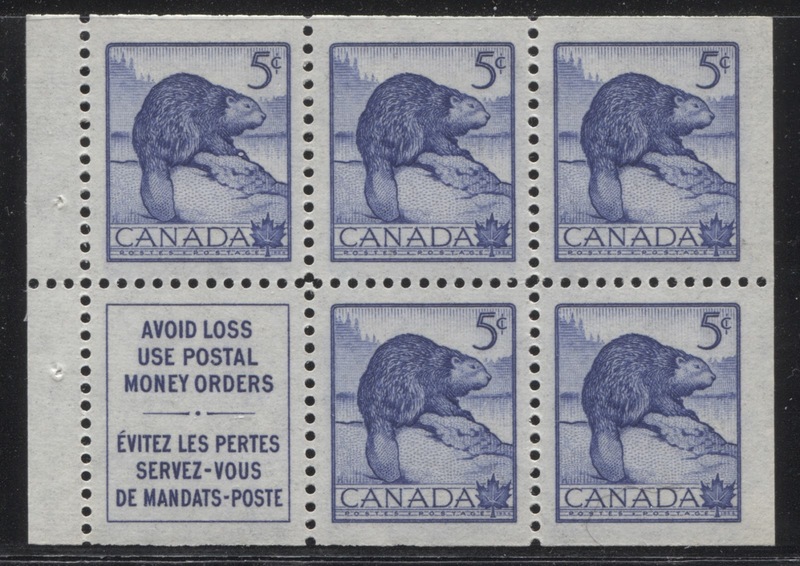 As far as I am aware, all 11 of these stamps can be found on both types of paper, though I do not know if one is scarcer than the other for any of these issues. 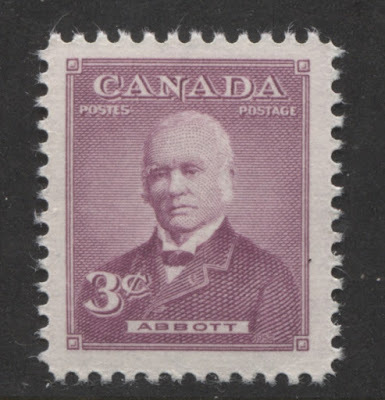 To determine that definitively would require someone to conduct a statistical study of a sample of these stamps drawn from the population at large. It is also possible to find differences in the paper colour. The sheet stamp shown on the left is on the normal ribbed, greyish white paper, while the booklet stamp on the right is on a cream paper with a yellowish tone. The paper also appears smoother and less ribbed as well. In addition to the above mentioned differences in texture, there may be differences in thickness as well that can be adequately measured and established by measuring the thickness of the paper with an accurate micrometer. 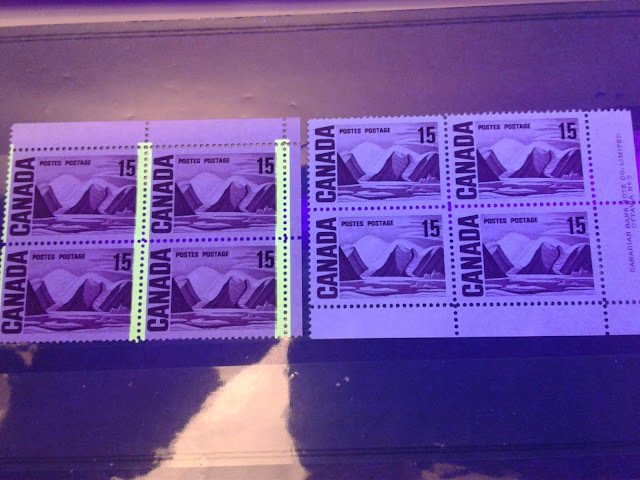 I have not done a study to determine which of these 11 stamps are found on each of the above paper types, though I am fairly confident that each of the ribbed and smooth papers probably exist with at least two different types of dull fluorescence, and also the dead, non-fluorescent reaction. You could have quite a bit of fun focusing on this aspect and trying to establish definitively which varieties exist. 1952 Red Cross Conference - 2 plates. 1952 3c John Abbott - 2 plates. 1952 4c Alexander Mackenzie - 2 plates. 1953 2c plar bear - 2 plates. 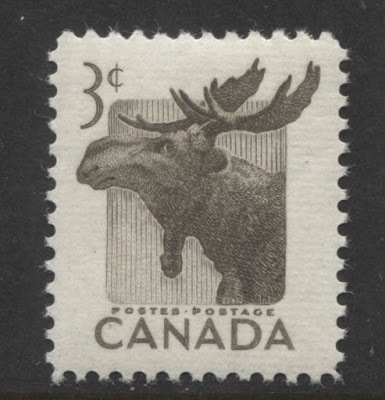 1953 3c moose - 2 plates. 1953 4c bighorn sheep - 2 plates. 1953 Coronation - 4 plates. 1954 4c walrus - 2 plates. 1954 5c beaver - 2 plates. 1954 4c Sir John Thompson - 2 plates. 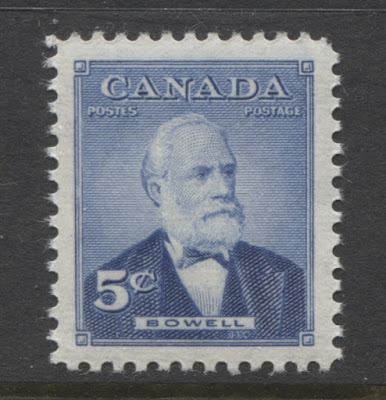 1954 5c Mackenzie Bowell - 2 plates. So a basic set of these blocks consists of 96 blocks. If each issue exists on 2 different papers and 2 different shades of each, you can potentially collect almost 400 different blocks. This can easily grow in scope if there are more then 2 shades of some issues, or if differences in paper fluorescence are studied in detail. Finally there is the issue of the order numbers and position dots that I have discussed in detail in my posts about previous issues. 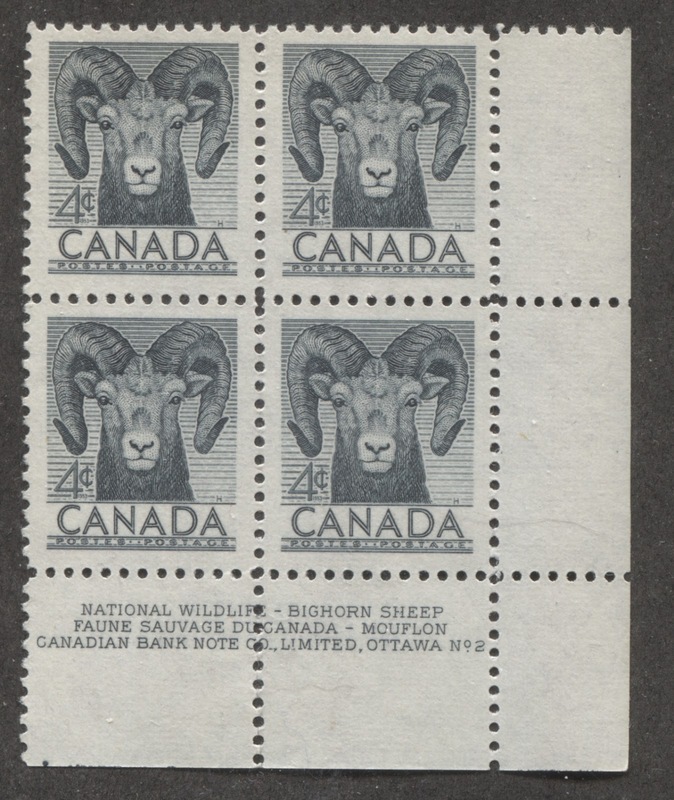 The above lower right plate 2 block of the 4c bighorn sheep is the only plate block that I currently have of these issues. So unfortunately I am not in a position to comment on what order numbers can be found on the lower left blocks, nor do I know if more than one configuration of position dots can be found on the plate blocks, and indeed which positions exist with dots. All I do know at the moment is that at least some of the lower right positions can be found with a single coloured dot in the selvage at the bottom left. As I acquire and examine more plate blocks of these issues, I will update this with details of which order numbers I come across, as well as anything I learn about the coloured dot configurations that can be found in the selvage. 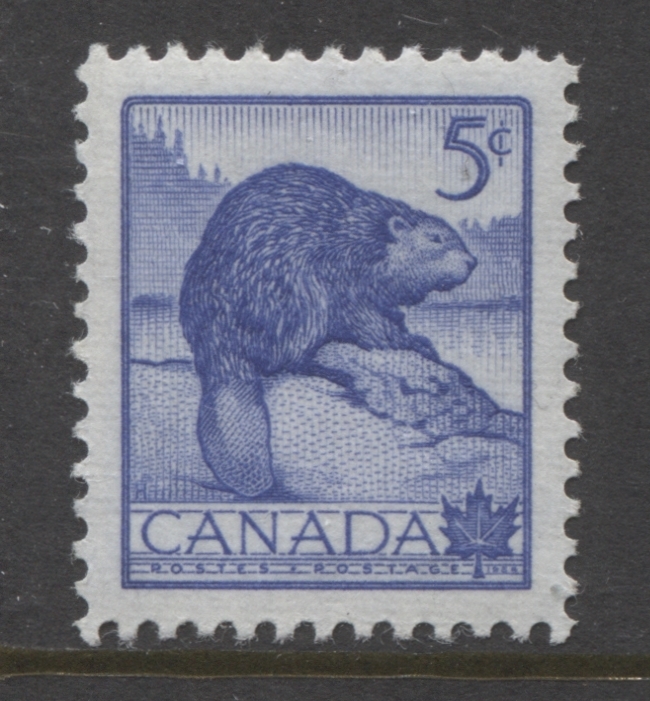 The 5c beaver stamp was also issued in booklets containing one pane of five stamps plus label. The booklets all had the standard bilingual cover shown above. However, both the front cover and the back cover can be found in two different dies, which I will illustrate here. In addition, some of the booklets were bound with a 17 mm staple, as shown above, while others were stitched with thread. Both types of booklet can be found with two types of front cover, and two different types of back cover, for a total of 8 basic different booklets. However, it is possible to find booklets where the covers contain some plate or die flaws that are not listed in any catalogue or handbook. For instance, if you look carefully at the front cover above, you will see a large blue dot next to the word "Cinq" in the text panel to the immediate right of the coat of arms. That is a plate flaw, as there is ordinarily no dot there. Finally, it is also possible to find booklets where one or both of the front or back covers show traces of the cutting guidelines, ones where the panes themselves show traces of these guidelines. Pane from a stitched booklet. Pane from a stapled booklet. If you look carefully at these two scans, you will notice that the shades of ultramarine are slightly different, with the bottom pane being deeper and slightly duller than the top pane. 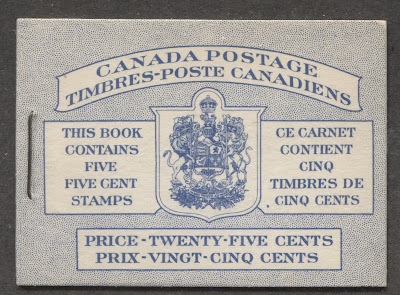 The scan shows what Peter Harris in his book "Canadian Stamp Booklets - Dotted Cover Dies 1935-1955" refers to as a type IIIg front cover. 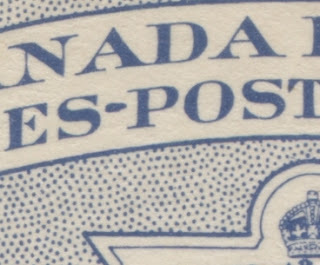 If you look at the hyphen between the words "Timbres" and 'Poste", you will see that it is torpedo shaped. Here we have a close-up scan of a type IIIh front cover. Here the hyphen is rectangular instead of torpedo shaped. In the case of the back covers, the difference lies in how the dots just outside the lower left corner of the text box are arranged. Here we have an example of what Harris refers to as a type Mi back cover. If you look at the lower left corner of the text panel, you will see two parallel diagonal rows of dots running from the top left to the bottom right. Here is a close-up of the Mii back cover type. Here, instead of two parallel diagonal rows of dots, there are two intersecting arcs of dots that start on one corner of the voided corner of the text panel and end in the middle of the concave arc that joins the left side of the text panel to the bottom edge of the panel. 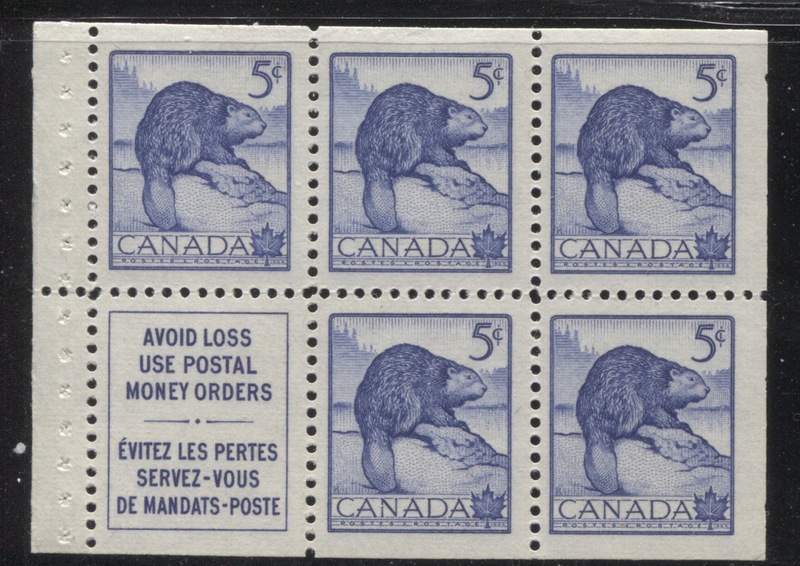 There are no known re-entries on any of these 11 stamps. However, given the very large numbers printed of each issue and the fact that only 2 plates were used for most of them, leads me to believe that there must be some re-entries out there that have yet to be discovered. Fortunately, most of these issues can still be found in full sheets, although these are getting scarcer all the time. The best way to look for these is to acquire a number of sheets and study them very carefully, looking for signs of doubling. Given that re-entries can occur when a plate is repaired, or otherwise re-worked, it is possible that two sheets from the same plate could differ in this respect, and so just because you examine a sheet from say plate 1 that does not show any re-entries, it does not mean that you can't find another sheet later that does show at least one. It can simply happen, if at some stage during the print run, a decision was made to strengthen some of the impressions in the sheet. So my recommendation would be to study a large number of full sheets first, and then if nothing turns up, consider studying a quantity of used bundleware. If there is one thing that the BNA Proofs website teaches us is is that a large range of die proofs, progressive proofs and essays exist for pretty well any issue of Canada. Usually they are very rare, and very expensive. Curiously the website does not list any proof material for these issues at all. I do not believe for a second that this is because such material does not exist. Rather, it may be due to the fact that very little to no material is known in private hands. However, I am of the belief that there must be some proofs out there. It may be that the only come up for auction very infrequently, but I think it is very prudent to keep a keen eye out for them in all the standard Canadian auction catalogues and to buy whenever the opportunity presents itself. Unitrade lists the common, inexpensive first day covers for these issues at $3 or so apiece. That is generally for the common Artcraft or Rosecraft cachets. However, many collectors would be surprised to learn that there were a small number of cachet makers operating at this time who produced very beautiful hand painted cachets like the Dyer cachet shown above. This one is currently featured in the April 26, 2017 Auction of R. Maresch & Son in Toronto. They have placed a $750 estimate on this cover. I don't think it will necessarily realize $750, but I would be surprised if it goes for less than $200. These types of cachets were very scarce because of how labour intensive it was to paint them. Collecting these presents a real challenge - not one to shy away from at all. Most of these can either be collected with the official Ottawa First Day wavy line machine cancellations, or they can be collected with small town CDS cancellations from the town in which they were prepared. It is definitely possible to amass a collection of several hundred different first day covers for these eleven stamps. 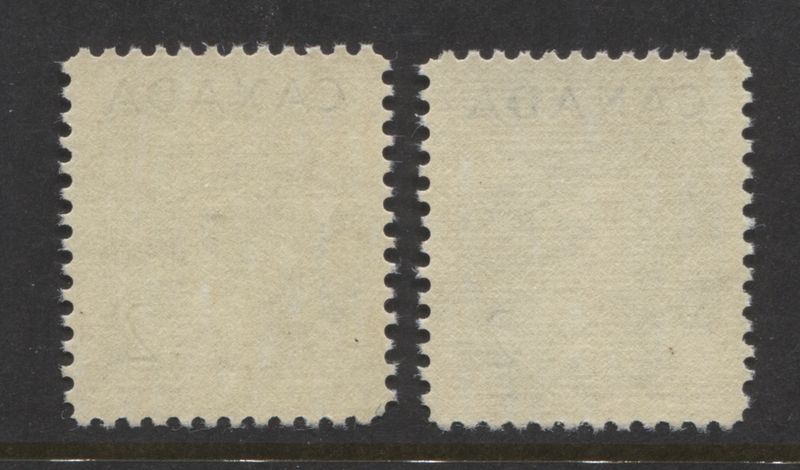 So covers bearing single usages of these stamps are not uncommon and can be collected fairly easily. However, they can become a bit boring very quickly unless you look for smaller town cancellations or covers that bear interesting illustrations such as graphic adverts or business stationery. One way to collect these that is more challenging and rewarding is to look for foreign airmail or registered covers that would have required at least 15c or more of postage, where the rate is made up with one or more of these stamps used in the proper period. They will be scarce, as the vast majority of these covers will be franked with high value definitives rather than these commemorative stamps. The more variety of current commemoratives you can find being used to make up the rate, the better the cover is. 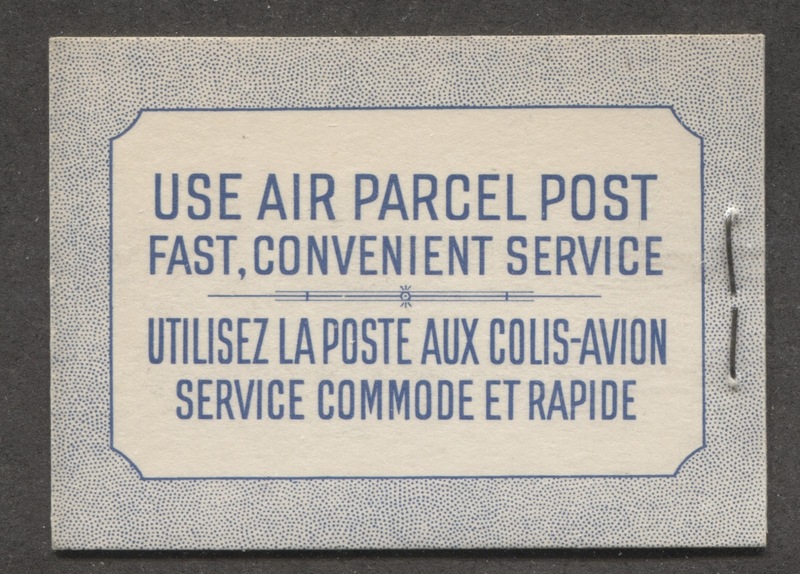 Personally I wouldn't be at all hesitant to pay $75-$100 for a registered airmail cover to an exotic African, South American or Asian country where the rate was paid with all the current commemorative issues of the time, rather than a large multiple of just one of these issues. Sure, a cover like this franked with a high value definitive might be a $5-$10 cover, but a cover franked with all the 1953 commemoratives or all the 1954 commemoratives, or a mixture of 1952 & 1953 or 1953 & 1954 commemoratives is a very scarce and desirable item when it is clear that it is not philatelic and represents genuine commercial use. Of course, last, but by no means least, you can collect small town CDS cancellations on all these issues. They will generally be a bit more challenging, due to their smaller size, but with patience, you can easily amass a collection of many thousands of cancellations. 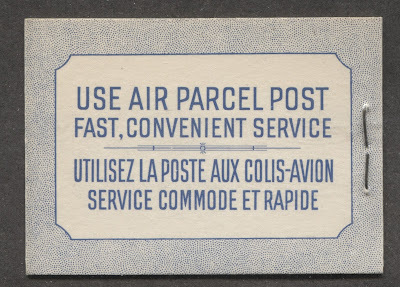 You can focus on a particular province, or a town (or series of towns), or you could focus on post offices that are no longer in operation today, or post offices that opened or closed during the period. This concludes my discussion of these issues. Next week, I will look at the commemorative issues from 1955, 1956 and 1957. I have the 2 different shades on the 5c Beaver. One is clearly darker blue than the other. Some of the other shade varieties you mention I've seen as well, I'll need to go through my late father's dealer stock of Canada to look for more.